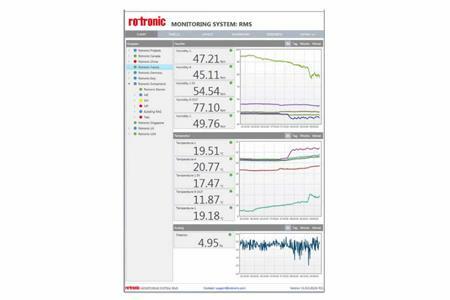 The RMS Server Software fulfills requirements for server-based monitoring. The software is linked to a database that stores all the measured data and system actions. The data can be accessed from anywhere in the world via all common platforms as long as an internet connection is available. Shows all parameters graphically and numerically. Enables sorting and filtering of all input variables available in the system. Visualizes which variable is measured where and its state. Offers the individual user the possibility to display the most important parameters for them in one view. Alarms, warnings and system messages are shown here clearly and can be acknowledged directly. The user can generate PDF reports, calibrate/adjust measuring points and manage the complete system. The database allows access to historical data at any time, thereby ensuring traceability according to FDA and GMP. This data can be combined in a complete PDF report quickly and easily. Regardless of the manufacturer or hardware, the software can run on all systems with a web browser. The user can therefore access it with all devices. Whether by voice call, email, SMS or switching of an alarm relay, the RMS offers clear alarm functions and records all events such as error messages, warnings or system messages in the database. The RMS Server Software enables validation at the touch of a button. The system checks the data integrity automatically by self-test, it switches all input modules into their various states and checks the alarms that are meant to be triggered. The software then generates a validation report on the complete system. The intelligent user management function makes it possible to assign different rights to every user on the basis of data groups. For example, the same user can have only read rights in data group A, whilst also having write rights in data group B.